We stay on top of our game so we can provide growers with competitive prices all day, every day. At Allied Grain, we achieve our goal of being a leader in the marketplace by providing multiple bids on a daily basis to make sure our growers have the option to market their crops whenever they feel the time is right. We offer competitive prices to our farmers by maintaining relationships with multiple grain buyers and keeping on top of trends in the wheat, ethanol and export markets. 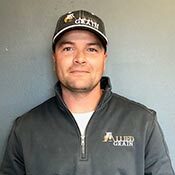 Allied Grain’s full-service facility in Barlow offers the convenience of on-farm pickup. Our fleet of 18 trucks and trailers can haul various grains, fertilizers and seeds throughout North Central and South Central North Dakota, and we can also load grain out via rail. Both methods provide access to a number of off-site bins that aide in separating the many different crops we handle. With the amount of volatility in the grain market, having a solid marketing plan in place is key to your success and profitability. Allied Grain is here to help you fine-tune your marketing strategies, offering a wide variety of services to provide a number of purchase contract options. We also distribute Market Wire – a weekly newsletter that’s packed with marketing info, tips, highlights, national and international weather reports and happenings in the grain industry. Ready to start working with Allied Grain? Just give us a call – you’ll be glad you did.